life. Buckingham begins by having the reader take the Strengths Engagement Survey (SET), to gauge the present involvement of their strengths in their job (completed online with a password included on the book jacket). On-going research from Gallup, etc. has shown that only 17% of employees regularly engage their strengths at work! After introducing Heidi, a brand director for Hampton Hotels whom he uses as an example throughout the book, he presents Step One where he “busts” what he calls the three myths regarding strengths – 1) As you grow, your personality changes, 2) You will grow the most in your areas of greatest weakness, and 3) A good team member does whatever it takes to help the team. Step Two is getting clear on your strengths. Your strengths should follow the “SIGN” acronym – Success, Instinct, Growth and Needs. Buckingham introduces “Strength Statement Cards” (provided at the back of the book) to aid you in capturing, clarifying and confirming your key strengths. Step Three is on freeing your strengths using the Strong Week Plan to set specific goals and actions to free up more of your strengths. This strategy can use what Buckingham calls the “FREE interview” – Focus, Release, Educate and Expand. Step Four focuses on stopping your weaknesses. Using “Weakness Statement Cards” (once again, provided at the back of the book), he asks you to look for the lack of “SIGN” to identify what are your true weaknesses. The “STOP” acronym is provided to decide how to handle these issues – Stop, Team up, Offer up strengths instead, Perceive your weakness from another perspective. Step Five teaches you how to speak up with your superiors to grow your strengths and limit your weaknesses, including some specific language and steps to introduce and promote this concept without undermining your career. Finally, Step Six introduces practical advice on building strong habits to keep the momentum going. Buckingham provides 5 steps keyed to the calendar to accomplish this. 1) Look over your strength and weakness statements every day, 2) Make a Strong Week Plan every week, 3) Close the books on your strengths each quarter, 4) Every 6 months pick a week and capture, clarify, confirm your strengths, and 5) Every year retake the Strengths Engagement Track survey. 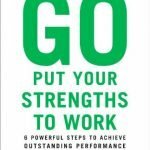 This interesting and practical book closes with some insights for the manager who wishes to develop the strengths of the team, as well as providing answers for the typical questions that come up in implementing the process.